Accidents caused by texting while driving are increasing in the US. away if the driver behind you does not stop. Also, when you stop, leave enough room between you and the driver ahead of you, so you have room to make a fast exit. Stock tail-lights are not bright enough for a texting driver to notice, so it is a good idea to increase your taillights and brakelights by four to six times. More tailights and brake lights, and they should be much brighter than stock. 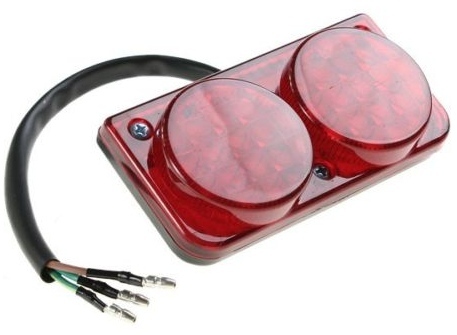 • If the look does not bother you, this four inch LED tail/brake or turn signal light can make a huge improvement in getting other drivers to see you. This is a double-faced light; the normal mounting in the US would be: red facing backward and yellow facing forward. Each light has 96 LED’s – 48 face forward, 48 face backward. It has 3 wires so it is a taillight and a brakelight OR a taillight and a turn signal. 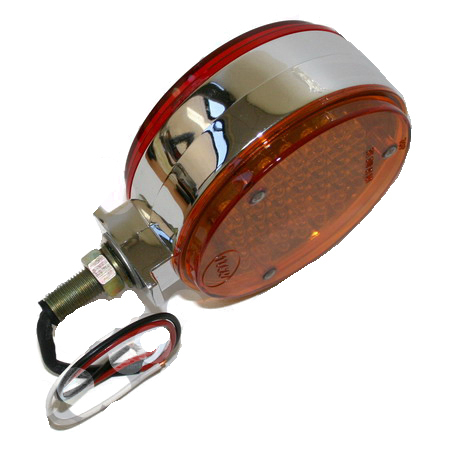 This is a high performance light – I could remove my four tail/brake lights and replace them with just one of these. I put two of these on my other bike 2 1/2 years ago and they have been great – I think they even discourage tailgating. I always thought these were “too much” for my Virago 250, but people have been tailgating me more lately, so I am thinking about taking them off my other bike and putting them on the XV250. 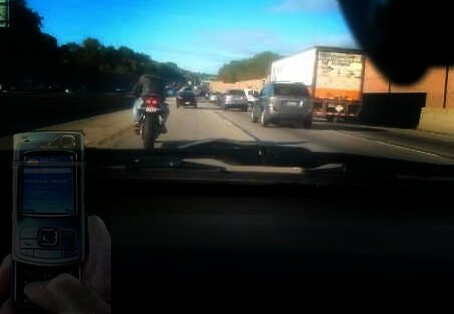 I use the Virago 250 for over 95% of my highway driving so it makes sense to do this. You do not have to get these – there are many other choices – just try to add more rear lighting so that your taillights and brake lights are 4 to 6 times brighter than stock. 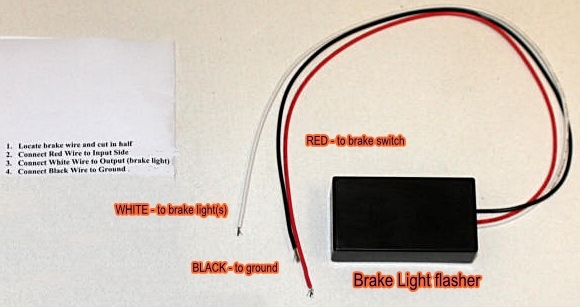 A brake light flasher is fairly easy to install, even if you are new to working on bikes. If you have a Virago 250, the rear taillight is very tight inside, so it is much easier to mount the brake light flasher under the seat. A) Cut the yellow wire (it is close to the rear fender). 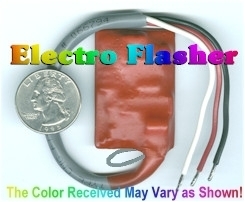 B) For the side of the yellow wire that leads to the back of the bike, attach the White wire of the brake light flasher. C) For the side of the yellow wire that leads toward the front of the bike, attach the Red wire of the brake light flasher. D) The Black wire of the brake light flasher can be attached to any ground – (1) a black wire, (2) the negative side of the battery, or (3) a screw into the frame (you can drill a small hole in the frame if you want). This small hole will be on the inside of your frame where people cannot see it – use sandpaper so that you have about a 12 mm circle of bare metal around the hole. E) This step is optional – you not need to do it. If your brake light flasher has a green loop of wire, cutting this loop will make the flashing cycle longer – it will flash an extra 5 or 6 times. If you drilled a small hole in your frame to attach the ground wire, now would be great time to run another wire from that screw to the negative terminal on the battery. This is the “2nd ground wire upgade” and makes a better ground contact. • The No.1 source of driver inattention is use of a wireless device. • Sending or receiving a text takes a driver’s eyes from the road for an average of 4.6 seconds, the equivalent of driving the length of an entire football field with your eyes closed (at 55 mph). 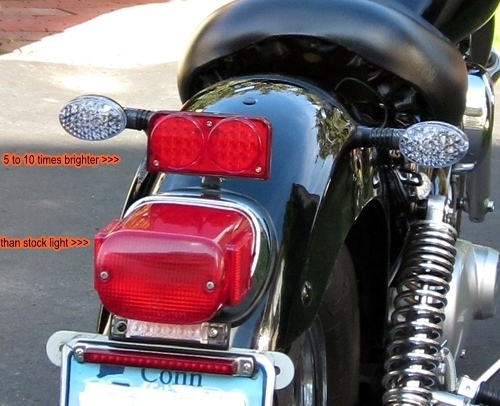 This entry was posted in Motorcycles and tagged brake light flasher, brake light flasher how install, bright taillight, cell phone and driving, Motorcycle safety, texting, texting driving, texting while driving, V-Star 250, Virago 250, Virago 250 lights, Virago 250 updates, XV250 lights. Bookmark the permalink.